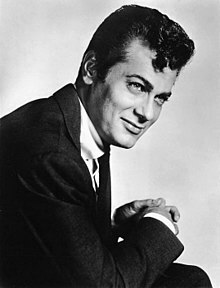 تونی کرتیس (اینگیلیسجه: Tony Curtis) آمریکالی اوْیونچو. ۳ ژوئن ۱۹۲۵ ایلینده نیویورک ایالتینده دۆنیایا گؤز آچیب. ۸۵ ایل عؤمر ائله‌ییب و ۲۹ سپتامبر ۲۰۱۰ میلادی تاریخینده وفات ائدیب. 1948–2008 ایللر آراسیندا سینما ساحه‌سینده چالیشیب. 1960 The Rat Race Pete Hammond, Jr.
1969 Those Daring Young Men in Their Jaunty Jalopies Chester Schofield also known as Monte-Carlo or Bust! 1959 The Joseph Cotten Show: On Trial Charlie Episode: "Man on a Rock"
1960 Startime The Juggler Episode: "The Young Juggler"
1965 The Flintstones Stony Curtis (voice role) Episode: "The Return of Stony Curtis"
1972 The ABC Comedy Hour Himself (Guest Performer) Episode: "The Friars Roast of Joe Namath"
1973 Shaft Clifford Grayson Episode: "Hit-Run"
1983 The Fall Guy Joe O'Hara Episode: "Eight Ball"
1996 Lois & Clark: The New Adventures of Superman Dr. Mamba Episode: "I Now Pronounce You..."
1996 Roseanne Hal Episode: "Ballroom Blitz"
1998 Suddenly Susan Peter DiCaprio Episode: "Matchmaker, Matchmaker"
2004 Hope & Faith Morris Episode: "Jack's Back"
2005 CSI: Crime Scene Investigation Himself Episode: "Grave Danger (Part 1)"
2006 60 Minutes Himelf Episode: "Gay Marriage/The Marilyn Mystery"
2010 Who Wants to Be a Millionaire Himself (Celebrity Question Presenter) Episode: "Million Dollar Movie Week 1"
↑ (Winter 2011) «Radio's Golden Age». Nostalgia Digest 37 (1). ↑ Kirby, Walter (February 10, 1952). "Better Radio Programs for the Week". The Decatur Daily Review. p. 38. Retrieved June 2, 2015 – via Newspapers.com. اینگیلیسجه ویکی‌پدیاسی‌نین ایشلدنلری طرفیندن یارانمیش«Tony Curtis»، مقاله‌سیندن گؤتورولوبدور. ( ۲۲ ژانویه ۲۰۱۸ تاریخینده یوْخلانیلیبدیر). قارداش پروژه‌لرده تونی کرتیس گؤره داها آرتیق بیلگی‌لر تاپابیلرسینیز.